In this DIY guide, find out how to construct concrete strip foundations for a building, what they are, how wide they need to be (thickness) and who you need to contact to inspect them to ensure they comply with building regulations for foundations. Includes a handy table of standard foundation sizes, foundation depths and foundation design. 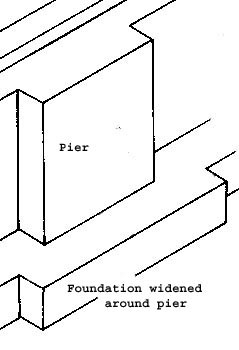 There are many types of foundation. Differing ground conditions, proximity of trees, backfilled land, soil types, proximity of drains, wind speeds, all dictate the form our foundation work will take. This project will deal only with the strip foundation, the most common and widely used. Indication will be given here where strip foundations may not be suitable. A strip foundation is quite simply a strip of concrete placed in a trench. 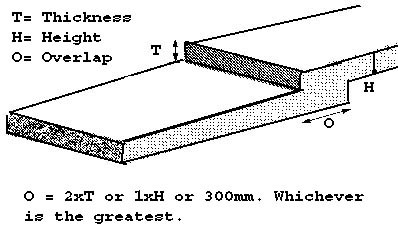 The absolute minimum thickness of this strip is 150mm. Please note that all of the loading figures given here may not apply to your project and should be checked by an architect on site. Soil samples and tests may be necessary. When can I use a Strip Foundation? If you can meet all the requirements of the above then, with the Building Inspectors approval you should be able to use strip foundations. Existing trees draw a considerable amount of moisture from the ground, this is especially important in clay soils. The ground will actually rise and fall (even without trees) in differing conditions and in a dry summer the trees will continue to draw water from the ground, shrinking the clay further. 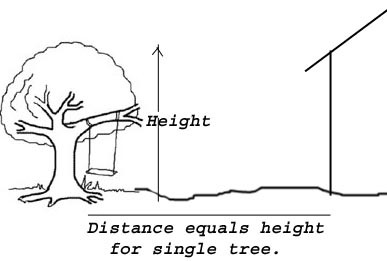 The ground can rise and/or fall up to 40mm around a tree between Winter and Summer. 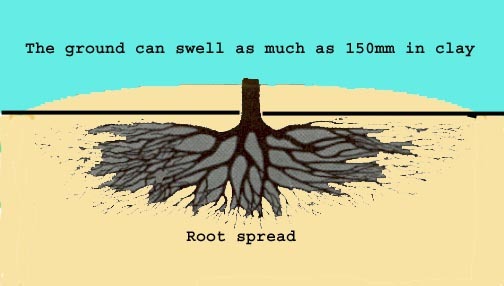 Where a tree has been chopped down, in clay conditions, the ground can swell up to 150mm as the roots are no longer drawing water from the ground. This can of course affect the foundations and any drains within the root zone of the tree. It is an accepted rule of thumb that, wherever possible, and using strip foundations, that the structure is kept away from the tree/s by at least as much as the height of the tree itself. British Standard 5837 suggests that special precautions are taken (unless investigation shows them to be unnecessary) with foundations that are to be constructed within an area equal to the expected height of a tree at maturity. Where trees are in rows, this may be increased to 1.5 times the height of the tree. These precautions may include piling the foundations, or other measures deemed necessary by the building inspector. It must also be remembered that dead trees will eventually rot underground and this can lead to depressions forming and weakened bearing. If there has ever been mining in the area, a special check will need to be made with local authorities as to the extent of the works. Foundation sizes are determined by the load placed on them. This load is spread throughout the property and comes to bear on the walls which are actually sitting on the foundation…For example, the weight of the roof, a particularly heavy part of the structure, is spread, via roof trusses to the walls of the structure. This is the same with the suspended floors contained within the property. This "loading" is calculated for the property and the foundations are designed to suit. However, the nature of the ground will have a great deal to do with this design criteria. To this end a table is produced within the building regulations for foundations, which dictates the size of the foundation for a certain loading in certain ground conditions. This table is called Table 12 Minimum width of strip footings and is reproduced below. The load is measured in Newton’s, units of force, which are calculated by taking the weight of the structure in kilograms, and multiplying it by 9.81, a figure which, in effect, is the maximum pressure gravity will place on that structure. Dead Load: This is the force attributed to the total structural mass of the building as mentioned above, roof etc. This will be the weight of all the materials multiplied by 9.81 to give Newton’s. Imposed Load: This is the force that will be imposed on the property in the way of people, furniture and fittings. The loading of snow (snow load) will come into this category and an allowance for this in all foundation design will be included in the calculations. Generally, for the design purpose of domestic properties, 1.5 kN/square metre is allowable and a snow loading of the same amount is applied to flat roofed buildings, while on roofs pitched over 30 degrees an allowance of 0.75kN/square metre is normally made. Wind Load: There are so many variables here it would take forever to explain the calculations. If you are dedicated enough to want to know, the "dynamic force" calculations can be found in BS CP3, Chapter 5 Part 2 (1972). For our purposes, and assuming the build to be of relatively low rise, in a normal, reasonably sheltered environment, a figure of 1 kN/ square metre is acceptable. Using these figures it is reasonably safe to assume (and given the ground conditions outlined in Table 12) that the total force from a traditional two storey dwelling to the ground will not exceed 50kN/ meter, with a bungalow of the same construction, not exceeding 30kN/m. The depth at which your foundations will start must be determined by the local authority, who will make the decision based on ground conditions. Once the ground conditions have been ascertained, loadings are calculated and foundation widths are decided, the depth oif concrete must be worked out. This is an incredibly complex procedure for normal mortals involving punching shear (the tendency of the weight to want to punch a hole through the concrete base) and tension (tendency of the base to bend under the weight) calculations, crushing strength of aggregates and all sorts ofmathematical procedures. The crushing strength of concrete in most domestic foundations is measured at 15-20 Newton’s per square mm. The nominal mix forhouse foundations is called a C15P mix (P = Portland cement) and is comprised of 1 cement, 2 sand and 6 coarse gravel. See our mixing concrete project for more information and calculation tables. 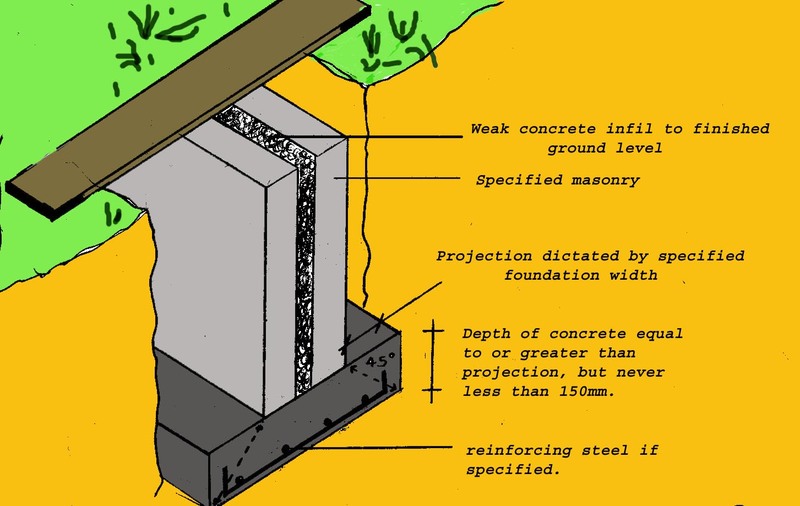 It is a general rule that the depth of the foundation will be equal to, or greater than, the distance from the front face of the wall to the edge of the foundation. This is indicated in the diagram below but the concrete depth will, never be less that 150mm. In some cases, reinforcing steel may be introduced into the strip foundation to allow a lesser depth of concrete. This will be a design situation. It must also be remembered that, if building the foundations in block work and/or brickwork, space must be found in the trench to stand and build. It is considered normal practice, in ground of the required bearing strength or better, to introduce concrete strip foundations of 600mm wide and 250mm deep. This will cover almost all eventualities in a domestic build and should only a single story be planned, the opportunity to extend vertically is not removed. The setting out of a building is made a great deal easier if the foundations are wider rather than narrower and allows for a margin of error in excavation. It is also worth noting that 600mm is a standard size for a digger bucket! The choice of filling the foundation trench with concrete is now given in most cases. And in most cases it is much cheaper to do so. The cost of the labour involved in laying bricks and blocks to ground level, together with the materials involved, is usually greater than the cost of pouring the concrete to the required height which, in most cases, is to within two brick courses of finished ground level. The diagram below shows the basic construction of a strip footing. The walls constructed below the ground are subject to pressure from the earth in both directions and are treated as retaining walls. It is therefore indicated in most domestic builds of this type, that any cavity be filled with a weak concrete mix (to be specified, normally 8 ballast=1 cement) up to finished ground level and in all cases 150mm below the level of the damp proof course. Pipes passing through the concrete must pass through a duct, purpose made and giving the amount of room, indicated by the local authority, to remove the possibility of pressure from any other surface coming to bear on the pipe work. Take a look at our video sections laying footings and laying foundations to watch a couple of films on how to do these tasks.